European settlement in the region developed in the 1840s, when a track was cut through to the coast so that wool grown around Braidwood could be loaded on to ships at Jervis Bay. The town of Huskisson later developed as a ship-building and fishing town. It now thrives as the centre of a leisure area. Jervis Bay measures about 15 km from north to south and about 10 km across. The main town is Huskisson, where you can hire dolphin-watch cruises, fishing trips and boats, but it’s the natural beauty of the area that seduces. The bay’s beaches are impressive – a series of scalloped coves bracketed by rock formations with backed by blackbutt, tea tree and mahogany forest. The bay’s sparkling waters, the underwater topography of arches, caves and rock stacks, and a marine population that includes gropers, wrasses, sharks, cuttlefish and sea dragons make this one of the finest dive sites in the State. 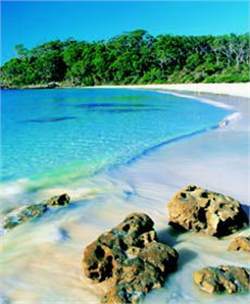 At its southern end, Jervis Bay is enclosed by Booderee National Park, a pristine coastal wilderness. From Wreck Bay village on Summercloud Bay in the park’s south, a walking trail circles the peninsula to St Georges Head, passing a succession of quiet beaches, cliffs and forests. 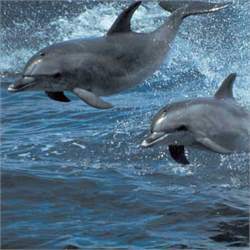 ~ Take a dolphin cruise or a whale-watching cruise from Huskisson. 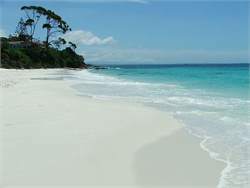 ~ Feel the world’s whitest sand between your toes at Hyams Beach. 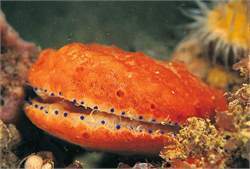 ~ Dive from Green Patch or take a boat-dive with a Huskisson dive operator. ~ Explore Booderee National Park’s heathlands and beaches. The See Change Arts Festival, in June, brings together the highly talented artists of the region for 16 days of art shows, craft exhibitions, workshops and performances.